The procurement process for the first armed drones for the Bundeswehr, the German armed forces, will be delayed by three to nine months after U.S. drone manufacturer General Atomics challenged the procurement decision for Israeli-built Heron TP UAVs in court, the German Defense Ministry told lawmakers on Tuesday. The ministry had decided in January to start the procurement process for the drones made by Israel Aircraft Industries (IAI). According to recent plans announced to parliament, a contract was expected for early 2017, with delivery of the first UAVs two years later. 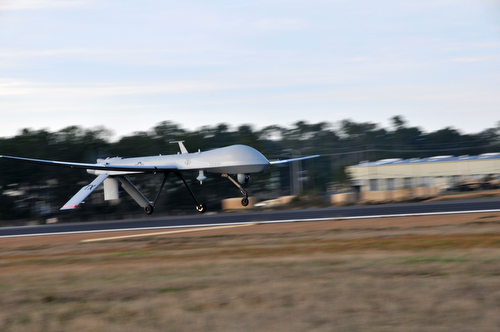 With the decision, the German MoD had rejected a proposal by U.S. UAV manufacturer General Atomics to procure its Predator unmanned aircraft. However, as of Monday General Atomics has called on the regional appeal court (Oberlandesgericht) in Düsseldorf to overturn this decision, the ministry informed parliament in a letter obtained by Augen geradeaus!. According to the German armament director, the company had challenged the decision already by appealing to the procurement chamber of the Bundeskartellamt, Germany’s Federal Cartel Office. The chamber rejected the appeal on August 17, the ministry said. After that, General Atomics turned to the court, which has the final verdict. While the MoD expects the court to confirm the ruling of the procurement chamber, the process might take between three and nine months, the ministry warned. A few months delay for the project is to be expected. The delay comes with a political problem for Defense Minister Ursula von der Leyen and the MoD bureaucracy. The final procurement decision will have to pass the parliaments’s budget committee, however with federal elections coming up in September 2017, the vote most probably will be influenced by election campaigns and a notable opposition to armed drones in the German public.